Swedish high-tech nozzle manufacturer, Unifire AB, has developed what may very well be the greatest leap in firefighting technology in decades–a fully automatic fire detection and extinguishing robot that is like having a firefighter on watch 24/7/365. The technology is known as the FlameRanger™. Unifire has combined its advanced firefighting robotic nozzles with its powerful PLC and software so that they can take in signals from, and send commands to, a virtually unlimited variety of electronic devices–from sensors & detectors to cameras and infrared cameras, to video displays, to valves & actuators, lights, computers, tablets, phones, etc. 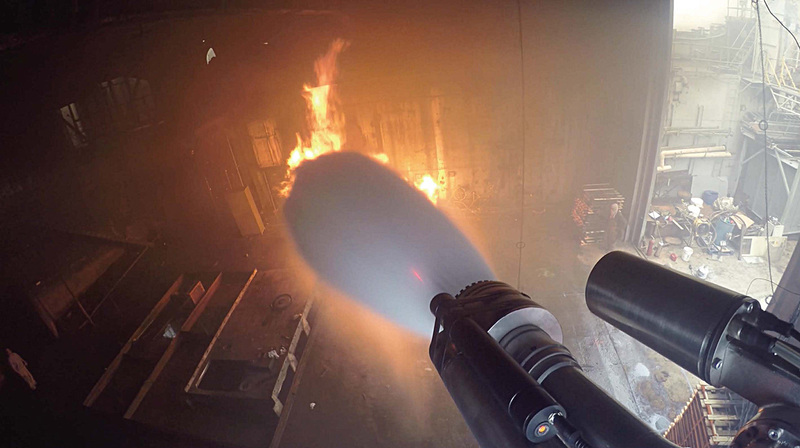 By combining the robotic nozzles with advanced flame detectors, the system is able to detect a fire within seconds and begin suppressing the fire directly at its source. In this live test, the FlameRanger detected, located and extinguished this fire in approximately 10 seconds from ignition. The technology can be used for a wide variety of firefighting applications, such as to protect tunnels, oil & gas facilities, large storage areas on naval vessels, yachts and ships, warehouses and manufacturing facilities, and aircraft hangars, to name just a few. A novel application for the technology is for the fire protection of high rise buildings that may be at risk due to the building materials and methods used–such as a number of recent fires have demonstrated in the United Arab Emirates. Rendering of the FlameRanger XT fighting a fire on a high-rise building. For this, Unifire has developed the “FlameRanger XT™”. Not only does it monitor for the presence of fire on a high-rise building’s exterior, but should one be detected, the system is designed to immediately aim the robotic nozzle at the fire and deliver a high flow (from 500 to 1000 liters per minute) of water or foam directly onto the fire until it is extinguished. And, it does all this completely automatically and without requiring any human intervention. Moreover, thanks to Unifire’s new InterAct™ user interface, the system can be monitored and controlled remotely over a secure network by desktop computer, or even mobile devices, from anywhere in the world. It can immediately alert officials of the exact location of the fire, allowing them to evacuate the building, call responders to the scene, and even allow firefighters to take over manual operation by remote control. Unifire’s robotic nozzle systems, including the FlameRanger, are fully networked and monitored and controlled remotely over any device with secured connection. Firefighters can remotely control the system from their smartphones, tablets or laptops. Tests of the FlameRanger system have demonstrated the effectiveness of the technology with stunning speed and success. According to Unifire, the system extinguished every fire in the live tests within 5 and 20 seconds of ignition. More information is available at FlameRanger.com or download our FlameRanger brochure by clicking here. Please contact us today to learn more about this revolutionary technology.